Plants have diversified, especially along the moist coastal regions. As soon as the high-energy radiation from the Sun was sufficiently reduced by the ozone layer together with further protection provided by the abundant numbers of large-leafy understorey plants that probably existed at this time, more and more animals of the sea saw an opportunity to take up land residence. At first the fish-like creatures probably moved through streams and rivers and slowly edged their way towards more shallow water and eventually onto the shore. Such a move would have been wise since it is quite possible that life was highly abundant in the seas and competition for food was extremely fierce. Negative reinforcement createindexd by predators and changes in water supply and positive reinforcement from food (such as insects and plants) were the two main factors supporting a move onto land by these adventurous new animals. 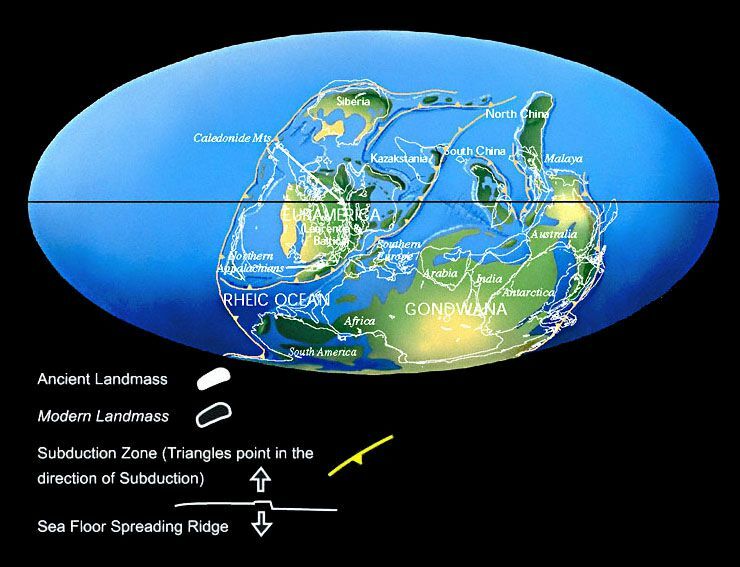 Earth during the Devonian era around 390 million years ago. Image © 1997 Christopher R. Scotese. As of 2014, an updated map can be downloaded from the Colorado Plateau Geosystems, Inc. web site and created by Professor Ronald C. Blakey of Northern Arizona University (NAU). Some fishes with backbones developed a primitive lung-system to breathe the rarefied air at this time. An example of a fish of this type was Eusthenopteron, a creature possessing a strong pair of fins for swimming and for crawling from one pool to another for short periods of time. 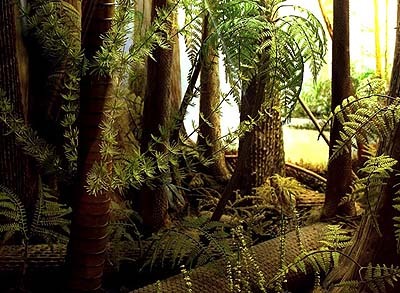 The first animals to walk on land (apart from the insects) seemed to have occurred around 375 million years ago. This is an artist impression of one such creature taking to the land called Eusthenopteron. Source: Reader 1986, p.63. 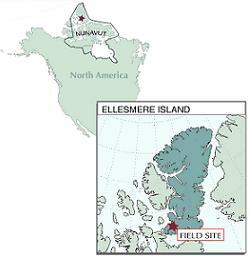 Then scientists unearthed a remarkable specimen in the frigid wastelands of Ellesmere Island in Arctic Canada (only 600 miles from the North Pole). It is a creature which "blurs the boundary between fish and land-living animal" according to University of Chicago's Neil Shubin, co-leader of the research team. "Most of the major joints of the fin are functional in this fish. The shoulder, elbow and even parts of the wrist are already there and working in ways similar to the earliest land-living animals. 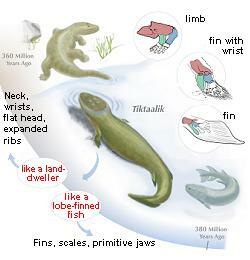 'When we talk about the fish's wrist, we're talking about the origin of parts of our own wrist. This animal is both fish and tetrapod." 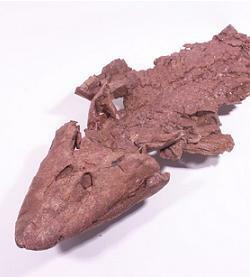 Dated to between 385 and 375 million years old, Tiktaalik lived in small streams at a time when North America was part of a supercontinent sitting across the equator. So far this is the closest animal-fish-like creature ever seen by scientists. "[The skeleton] indicates that it could support its body under the force of gravity whether in very shallow water or on land. This represents a critical early phase in the evolution of all limbed animals." Prior to this, Panderichthys of 385 million years ago was thought to be the closest link with its four limbs and fish like features. 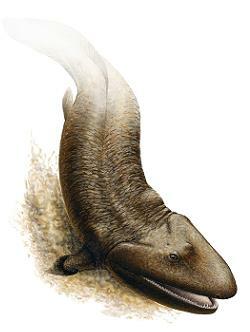 But because Tiktaalik could actually support its body above water better, this latest finding became the next crucial evolutionary clue. The first animals to adapt quite well to land still depended a great deal on a rich water supply for their survival. Creatures that depended on water and yet still be able to breath the air on land are known as Amphibians. In the meantime, plants spread to every corner of the land, causing oxygen levels in the air to suddenly rise again and so benefiting the rapid development of animal life on land. 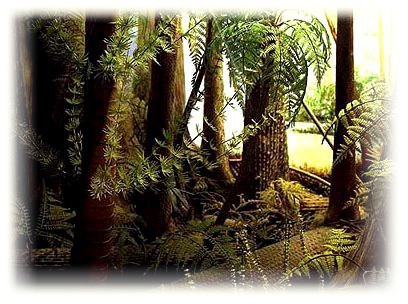 Among the plant life that existed included a variety of conifer trees of various sizes which, at the time, made-up a large proportion of prehistoric forests. Ancient fern trees are a common sight for this era. Image available from http://www.handprint.com/PS/GEO/carbl.jpg. 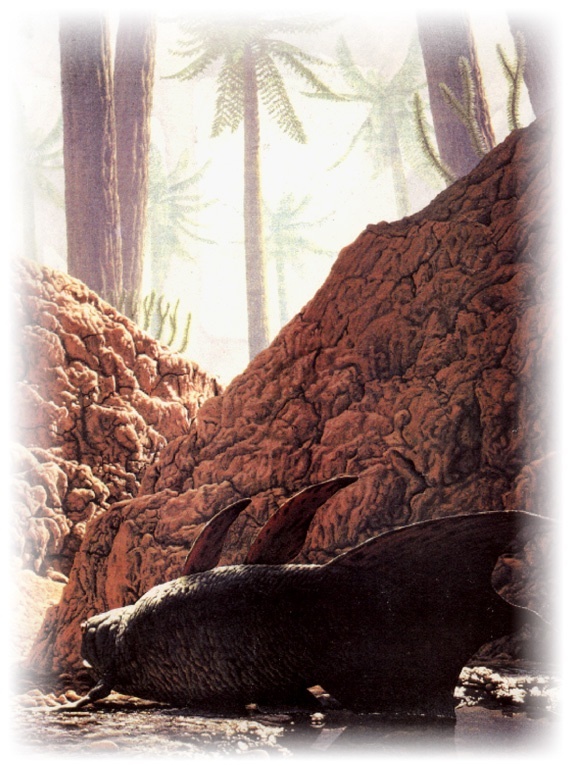 Another major and widespread extinction occurred in Late Devonian period (1). Although not as great as the first major extinction, enough creatures in the sea (about 82 percent of species and 55 percent of genera), especially many coral reef invertebrates and primitive fish species, had their lives curtailed by something in the environment, possibly an asteroid impact over land. In fact, it is now known that a 5 kilometre-wide asteroid did crash to Earth between 350 and 200 million years ago. The evidence for this has been found in Australia after a team of geoscientists from the WA Department of Minerals and Energy's Geological Survey of WA discovered a massive 120 kilometre-wide crater buried between 60 metres and 100 metres below the ground. The impact site, centered around a remote station of Woodleigh in mid-north coastal Western Australia (WA), is thought to have created a sudden drop in temperature in the area as dust was thrown high into the atmosphere, blocking the heat and light from the sun from reaching the ground. "...The crashing into earth of the asteroid would have been destructive locally, causing huge earthquakes and volcanic activity, while minor tremors and possible volcanic action would have occurred in other parts of the world. Of course, whether this catastrophic event was the cause for the massive Late Devonian extinction is still debatable. NOTE 1: Certainly global cooling did occur at this time leading to a massive ice age. When this happened, sea levels dropped exposing more of the continent of Gondwana. But some scientists prefer to avoid the asteroid theory on this occasion in favour of natural climate change (whatever that means). NOTE 2: Indrani Mukherjee, a researcher from the Centre of Excellence in Ore Deposits (CODES) at the University of Tasmania has noticed in pyrite grains obtained from cored samples of black shale drilled in the ocean bed has uncovered a lowering of selenium in the oceans at around the time of this extinction as opposed to other periods when no extinctions showed high levels of selenium. The exact cause for this is unclear, but she is raising the possibility that the extinction need not have to originate from outside the Earth. Perhaps a lack of tectonic plate activity could have reduced the amount of minerals available to organisms in the oceans to grow and this could affect other species on land. More investigations are taking place to determine the cause. The Canberra Times 22 April 2000, p.9.